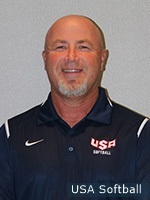 Ballpark Broadcasting’s Jim Flanagan talks with USA Assistant Coach GREG HICKS, on Saturday morning, September 23, 2017, following the USA team’s big win over Canada in a first round playoff game at the 2017 Pan American Championship. The USA finished pool play with a 5-2 record, and with the win over Canada, is assured of a medal. The USA will take on Argentina Saturday afternoon, Sept 23, 2pm EDT scheduled start (likely 4pm with possible rain delay).